Celebrating your baby’s first birthday is such an exciting time! We’ve had the privilege of celebrating five first birthday’s – one for each of my boys. It’s always such a bitter sweet day. It’s exciting to see their growth and development over the past year, but also heartbreaking to look back and remember your tiny newborn baby who needed you for everything. With their first birthday, their whole world is filled with changes from walking and talking and even transitioning to more table food. Our little babies are growing up, and it’s a really big milestone we get to celebrate – it’s one worth making a big deal about! I received a Babies”R”Us gift card for this post. All opinions are my own. 5 Essentials for the Perfect 1st Birthday! Birthday Outfit – I have to say, this is a splurge that’s totally worth it! It might be an outfit that they’ll only wear once or a handful of times, but it really helps them feel special all through the day. When you go out and about people will stop you and talk to your little one and wish them a happy birthday. Plus, of course, the outfit will look darling in their pictures which last a lifetime. We even had a birthday bib with my first son! How absolutely adorable are these two birthday outfits? 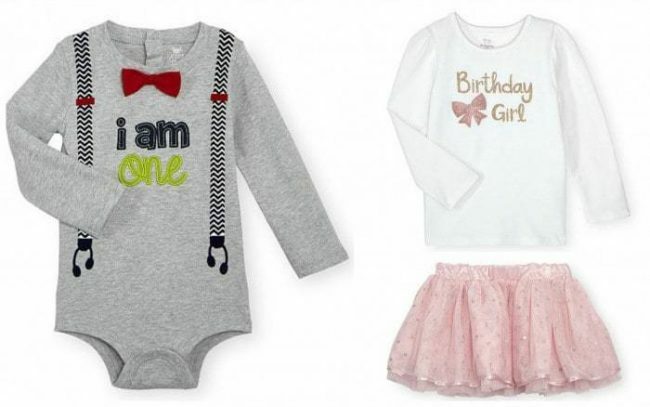 Babies”R”Us has a bunch of cute outfits to pick from to make their first birthday celebrations memorable. Decorations – Pick out a theme or go with a color and decorate the space to get ready for party time. 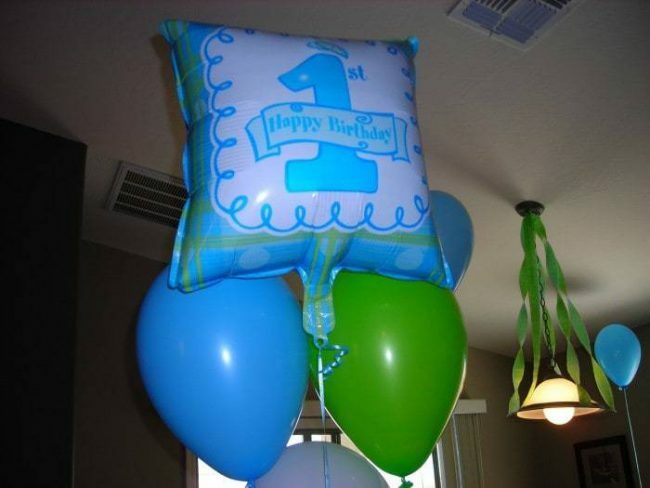 I’ve yet to meet a 1-year-old that isn’t obsessed with balloons so those are a must for your birthday celebration! If you pick a mylar balloon, you can save it when it has deflated and stash it away in their memory box as a nice keepsake. Smash Cake – It’s all the rage now to make an individual cake just for your little one and let them go to town. Even if you don’t get them a large fancy cake to call their own, be sure you pile up their high chair tray with a big helping of cake and frosting and let them go to town! It will make for the best pictures you’ll treasure forever! Take Lots and Lots of Photos – You’ll certainly be busy on at the birthday festivities, so assign a family member or friend to capture the day for you. You really can’t have too many pictures of their big day and having lots and different angles will let you go back later to save your favorites. Keepsakes – Make sure you capture and preserve this memory the very best you can! That could be, scrapbook the pictures from the day, saving the mylar balloons from the party, stashing their birthday outfit in their keepsake box, or whatever you can think of. We got this really hilarious birthday boy hat for one of my boy’s 1st birthday. It was so funny on him and still cracks me up to this day to see it. It makes a really memorable keepsake of his birthday. 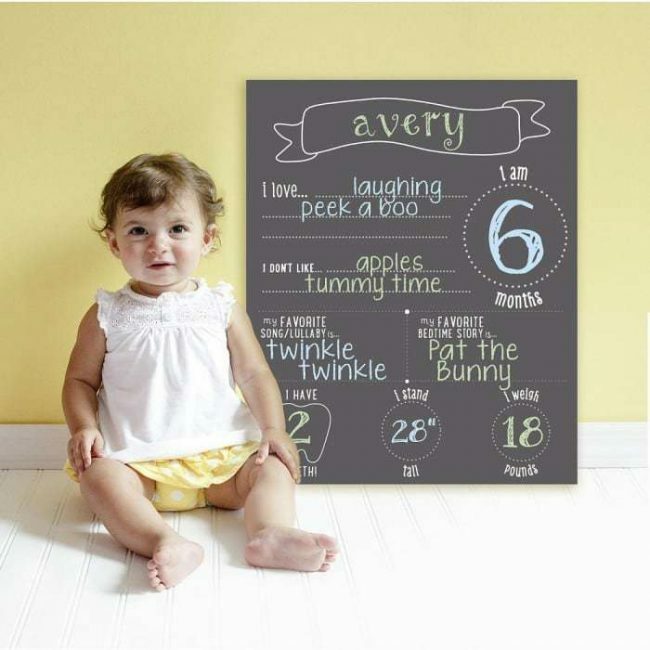 I adore this reusable chalkboard photo prop available at Babies”R”Us. You can fill in your little one’s stats and favorites and preserves that information in a custom picture you can take with your little one once a month. I love this because baby books can get lost but pictures get backed up and stored and protected the best ways we know how, so even if you lose the baby book you can look back and watch their grow as you flip through your albums. 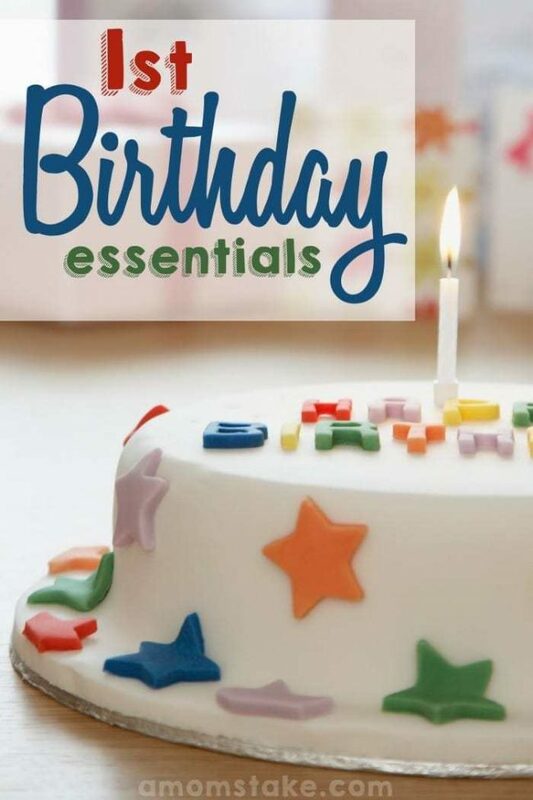 Bonus Essential: Join Birthday Clubs! There’s nothing more fun than getting surprises in the mail. Toys”R”Us offers a free-to-join Geoffrey’s Birthday Club! When you join you can get a birthday phone call from Geoffrey, the Toys”R”Us mascot! You’ll also get a birthday card in the mail for your child with a coupons and discounts until your child’s 10th birthday. Head into Toys”R”Us on their birthday day and they’ll be recognized with a birthday crown, Geoffrey balloon, and a personalized announcement broadcast across the store! My boys have been on the Geoffrey’s Birthday Club since they were little. They’re always counting down and asking when their birthday card will arrive. Sometimes it’s been a $5 off any purchase of $5 or more coupon and other times it’s been a percent off. Either way, it’s been big savings and a fun way to let them head into the store and pick out a gift to call their own. If you have a little one having their very first birthday soon, you won’t want to miss this exciting Baby’s First Birthday event coming to Babies”R”Us stores this Saturday, August 27th from 10am-11am. Head into your local store to celebrate this big milestone with activities and giveaways along with inspiration to help guide your party planning for the big day! There will be another event coming up in January if you are still a ways off from the big first year celebration. You can shop Babies”R”Us all year long for the perfect accessories, apparel, gifts, and My First Birthday products. Whatever you’re planning for their big day, head to a Babies”R”Us near you to make the day special. 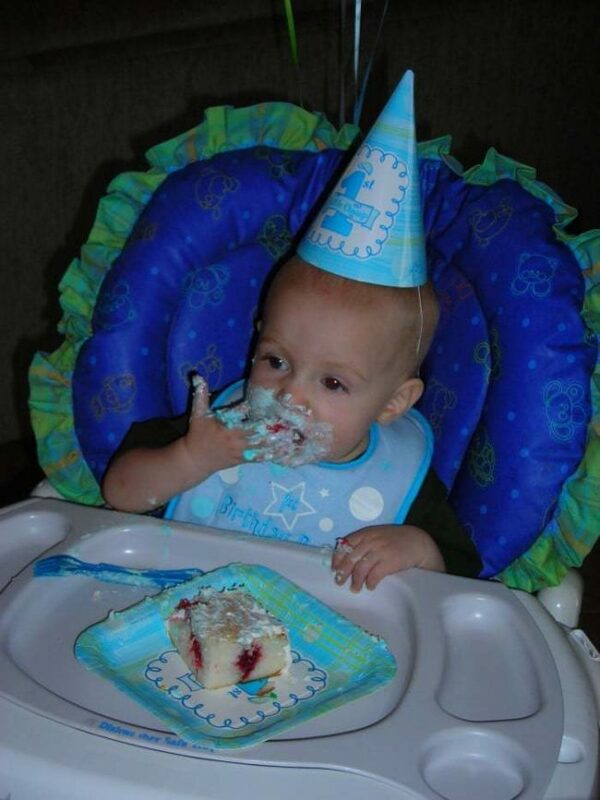 How do you plan to make your baby’s first birthday special? I really LOVE that last sign that shows all the baby’s favorite things. I wish these ideas were around when my kids were little. These are some good ideas for a first birthday. It’s always fun to do something special for such a milestone. 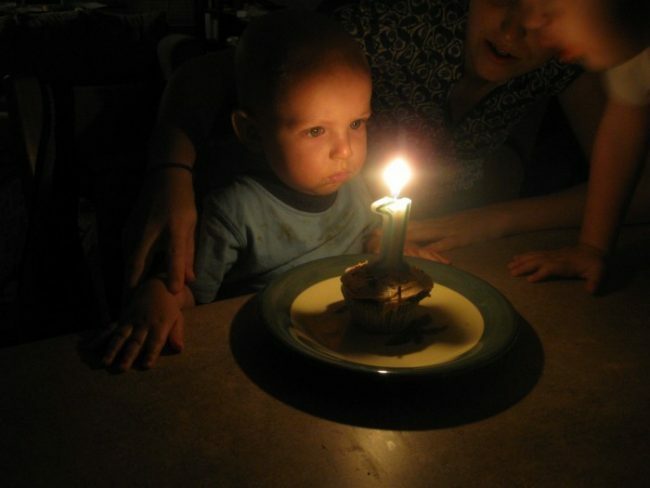 First birthdays are always a big deal, but sometimes they can be a bit overwhelming. Thanks for putting together such a fun and comprehensive list of things to make the big day special. Those outfits are so cute! I love planning birthday parties for my girls! Since Their older now, I let them choose the theme. I love planning birthday parties! I go all out! So much fun to plan and look forward to. my friends daughter is about to turn 1 and she’s planning the party, i’ll have to show this to her. My son’s birthday was the best ever! 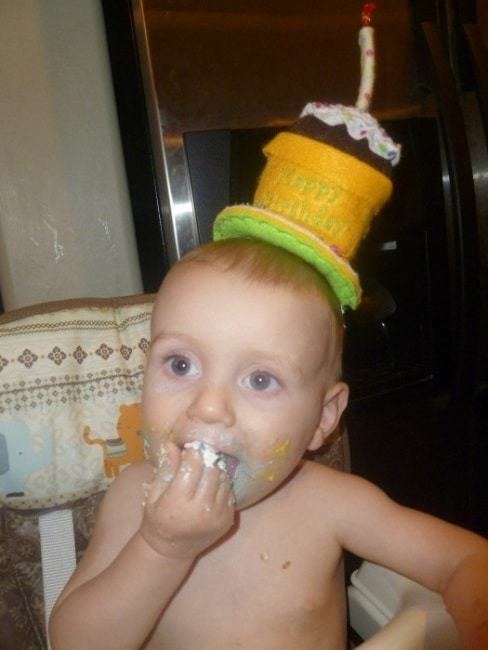 He had his first cupcake, we had everybody over, it was so much fun!! The last first birthday party I planned was so fun. I love the little onezies with the cute sayings on them. The cake smash was the best part. We had so much fun at our kids first birthdays. I took so many photos it is fun to look back at them now. I love going to baby’s first birthday parties.It is always fun watching the baby eat their cake. We had a small party with our family. So cute! These are some great ideas. For my son’s first birthday we had a game where people guessed what picture of him was from a month of his life. They had a blast. That hat is just the cutest thing ever! I am actually an expecting momma so articles like this make my heart melt! The outfit and the cake can make our break a really cute photo opp! I love your advice to make sure that those are perfect. First birthdays are always so much fun! I love all of your tips to make it the best it can be. I love all of your ideas. I took lots of pictures when my girls each turned one. So many memories to cherish. The first birthday is one of the best. I love when they smash their piece of cake and get it all over the place. My son’s birthday is coming up soon but it is not his first birthday. On his first birthday we actually did a lot of stuff that you did here. My favorite part was watching them get messy with the cake. Dawww. The first birthday cake is always the best! I love it when the little ones make a mess of themselves. We had quite a long list of first birthday needs for my daughter, she needed a super cute outfit, and plenty of nice decorations. Make sure to take tons on pictures. 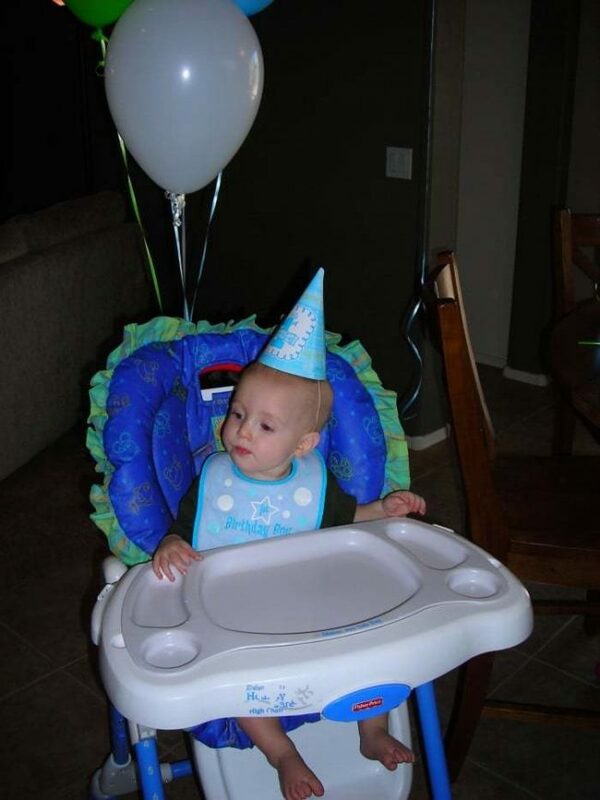 I miss 1st birthdays <3 It looks like a great party. My great-niece is getting ready to be born and I will let her know to sign up to get Babies R Us events. Love this! It’s so easy to go overboard with 1st birthdays, but these simple ideas are much more likely to make it a great day. Thank you for sharing. 1st birthdays are so much fun! I love doing a smash cake. It’s nice Babies R Us is having a 1st birthday event. These are some great ideas! Cute photos!He looks like he really enjoyed the cake. For my daughters first birthday, we of course had a cute outfit and a smash cake (since she smashed one I made two) it was mostly family there. I think the pictures are the best part because really the child doesnt remember it !